Never Enough Nails: Zoya Wishes Holiday 2014 Swatches, Part 2! Hi everyone! Sorry for the late post today, but I was trying to get a few Christmas decorations up finally. I got some outdoor lights up, the stockings, and a few other indoor decorations so far. I bought this really cool beaded gold Christmas tree at JoAnn fabric. The beads and glitter on it are holo!! I have to take a picture of it and show you all. It was also 60% off! 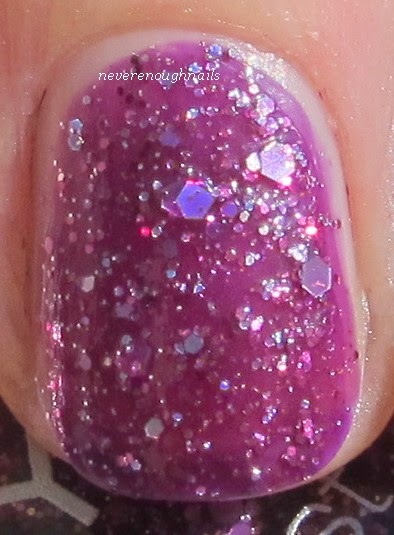 Speaking of holo, the Zoya PixieDusts from the Wishes collection have tons of holo glitter. 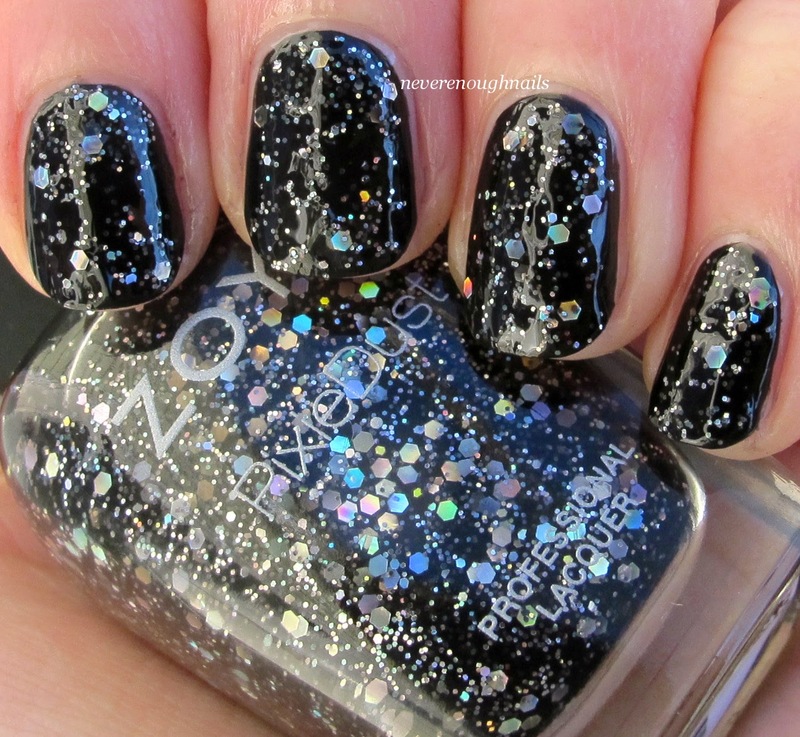 This one is Zoya Imogen, a matte black base packed with large holo silver hex glitter and lots of smaller glitter. The three PixieDusts in the holiday collection are Magical PixieDusts, with lots of holo glitter. They are a little chunkier, but so sparkly! This is 3 coats of Imogen. The black base is semi-sheer, to let the glitter show through, so I felt it was best with 3 thin coats. The formula is typical of the Ultra/Magical PixieDusts. They have a lot of glitter in them, but I don't find them to be hard to apply. I find that you do need to let them dry in between coats for the best results. The holiday PixieDusts kind of coordinate with the other polishes in the holiday collection, so I thought I'd show you Imogen layered over Zoya Willa. This is one coat of Imogen over Willa, with one layer of Sally Hansen Insta Dri top coat. This is smooth to the touch. Layering Imogen over Willa really made the holo glitter stand out, I loved this combo! Zoya Thea is described as "deep amethyst Magical PixieDust with an orchid flash, packed full of party-ready holographic hex glitter". Thea is a grape jam jelly matte base packed with holo glitter. The grape jam has a little bit of a pink tint to it, or "orchid flash" if you will. This is 3 coats of Thea. I originally applied two and it looked fine to me, but when I took the pictures it looked very sheer. So you may find two coats to be perfect for you if you aren't taking pictures of your mani very often! This was also more sparkly in person. My favorite of the three holiday Magical Pixies is Zoya Nori. This sparkling ice blue matte base packed with holo glitter is perfectly chilly for a winter snow storm. I want to do this with a silver glitter accent nail. I just love ice blue and silver together in the winter! This is 3 coats of Nori. It applied really well and seemed smoother than other Magical Pixies. Although maybe it was just my imagination, since it has as much glitter as the others! Overall, I really like the direction Zoya took for their holiday collection. I am still in love with textures and wear them whenever I need a speedy mani, so I love all three of the Magical PixieDusts, especially Nori. I also really love Prim and Haven. This is a great collection for year round, not just the holiday season, so you don't have to save these for December! The Zoya Wishes holiday collection is available now at zoya.com. I really like them, especially the blue and purple!!! They are so gorgeous!